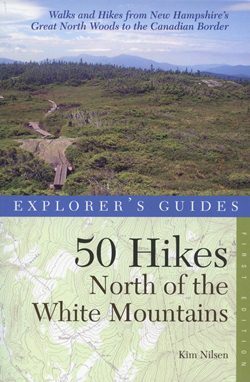 50 Hikes North of the White Mountains, by Kim Nilsen, 2012. This guide, written in Nilsen's trademark engaging style, leads you to a great variety of hikes north of the Presidential Range and up to the Canadian border. Included are treks in the Crescent Range, Pondicherry area, Kilkenny region, Nash Stream Forest, Dixville Notch, Connecticut River headwaters, Dead Diamond River region, and boundary mountains. There are peaks, ponds, swamps, meadows, ravines and waterfalls to be explored, some described for the first time in a guidebook. Maps and photos included. 272 pp., 6" x 9."